Notes: Among adults 18 to 59 years of age. 1 Percentage for men is significantly higher than women. 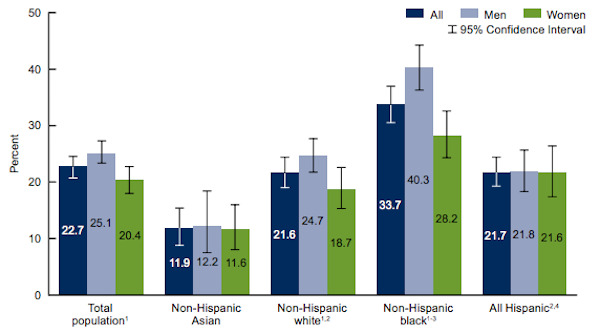 2 Percentage is significantly different from non-Hispanic Asian, all, men, and women. 3 Percentage is significantly different from non-Hispanic white, all, men, and women. 4 Percentage is significantly different from non-Hispanic black, all, men, and women. HPV is human papillomavirus. High-risk genital HPV means tested positive to one or more of the 14 high-risk HPV types (16, 18, 31, 33, 35, 39, 45, 51, 52, 56, 58, 59, 66, or 68) from a penile or vaginal swab sample. Penile samples were available only for 2013–2014, so all results presented were limited to that cycle. Data Source: NCHS, National Health and Nutrition Examination Survey, 2013–2014. This entry was posted in Medicine and Society Data Watch on April 12, 2017 by Genevra Pittman.